Startup founders and co-founders seeking to create impact with their ventures. Aspiring entrepreneurs and innovators and those considering starting an impact venture in the future. Professionals who want to understand more about the field of social innovation, social entrepreneurship, and social enterprise. Students at all levels who are looking for a multi-lens view into the impact venture space. Companies and intrapreneurs seeking to better understand the growing social impact sector to incorporate into their business and roles. Informed consumers who realize we vote with every dollar we spend. Anyone who wants to explore social impact. What makes the book interesting, relevant, and fun? It is a Q&A of 51 questions on social entrepreneurship that can be read in order or piecemeal to make it easy to find what you are looking for in whichever stage of learning and research you are in. It is composed in a story format with three characters and their quest for actionable information for their own idea, making the process of reading fun and engaging! The story also puts common social entrepreneurship questions in context, so you know how it could be applicable to you in your social impact journey. The characters help frame differents perspectives engaged in the space, and connect you to what drives their work. It points to other resources so you can further your exploration. Ebook readers can click on resources to directly and easily reach the live links. 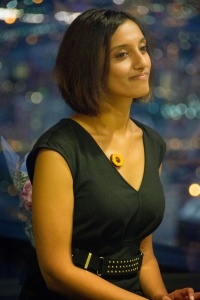 Neetal Parekh is the Founder & CEO of Innov8social, which builds tools to help social entrepreneurs, companies, and individuals reach their social impact potential. Neetal is an experienced communicator, with a specialty in social enterprise, startups, social media strategy, writing/blogging, and public speaking. 51 Questions is more than a resource for social entrepreneurs. It opens up the conversation about how social entrepreneurs can create something with an impact and compete in the for profit entrepreneurship world. As a social entrepreneur, I know how hard it is to get people to listen to you. Neetal’s book and her life’s work with Innov8social, allows fellow social entrepreneurs to have a platform for their vision. I highly encourage anyone looking to leave a legacy to read this book and join the Innov8social community. The time is now to live beyond ourselves and make a deep impact in the world around us. Whether you’re starting your 1st social enterprise or your 10th, you will find immense value in this definitive guide to social entrepreneurship. Unlike any other resource out there, Neetal’s expertly researched and infinitely readable first book gives you the blueprint to start, scale, and improve your social venture. 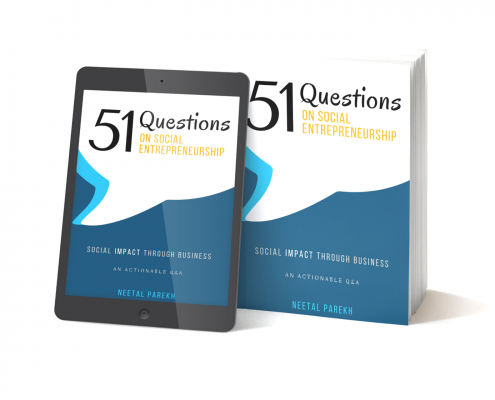 This smart book answers 51 FAQs about social entrepreneurship with the story of three entrepreneurs who start a successful social enterprise. Following them is fun and will prepare you to confidently start your own. A refreshingly helpful book! When my co-founder Alejandro Velez and I started Back to the Roots in 2009, we had so many questions about what we were getting into. 51 Questions answers many of the questions we had then as well as the ones we didn’t even know to ask! A great guide for social entrepreneurs looking to hit the ground running. Answers to the most common questions when embarking on the exciting path of social venturing.